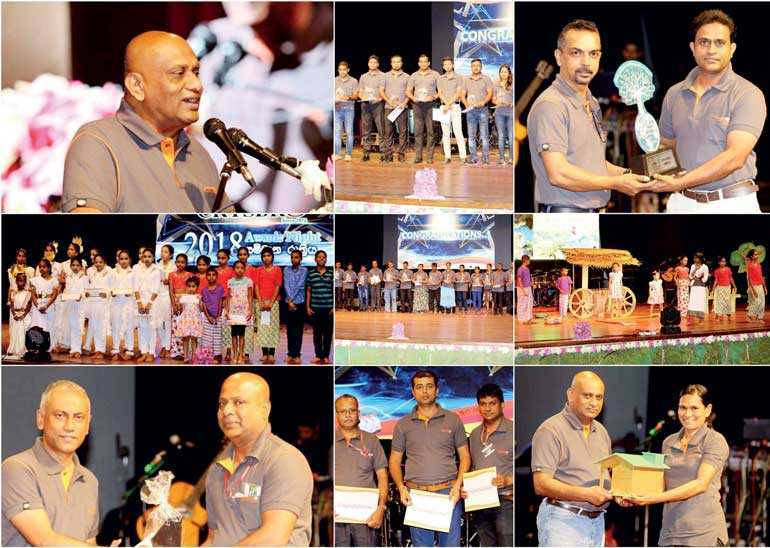 Pioneer in Sri Lanka’s poultry sector, CRYSBRO Group of companies held their Annual Awards Night recently at the Mahinda Rajapaksa Auditorium at Polgolla, to appreciate the high flyers and to celebrate 46 years of unabated excellence in contributing to the nation’s nutritional requirements. The commemoration accommodated the Board of Directors, the Senior Management and the invitees of technical consulting teams together with over 1,100 employees located in 17 business locations island wide covering six companies of the group. The highlight of the evening was the awards ceremony where 31 employees from various business teams were recognised as top performers including 16 employees from the junior category who were awarded with cash prizes in addition to a local family day-outing and another 12 executive level employees were awarded with cash prizes and one-night family outing in a local star class hotel while three Senior Managers were awarded a family overseas tour. Alongside the merriment, 20 donations for housing renovation and five brand new houses for CRYSBRO employees were declared under ‘Praja Aruna – Housing Scheme’ for the years of 2018 and 2019. “I take this opportunity to express my gratitude to all employees who have shown great dedication throughout the years and have contributed immensely to the growth of the company. Moving forward, the management expects employees to gear up with loyalty, commitment, honesty, different thinking patterns and discipline, which as we believe are fundamentals of success,” stated CRYSBRO Chairman/Managing Director Mohamed Imtiaz. Moreover, the evening marked the introduction of two special awards namely ‘Haritha Sathkaara Green Award’ and ‘Most Improved Business Location Award’ which were presented to the Galgamuwa Farm and the Paragala Farm respectively along with tokens of appreciation for the locational leaders. The attendees were entertained by the extraordinary performances by the three winning teams of ‘Sisu Diriya’ dancing competition 2017 (Pupurassa Team won the 1st place; Head Office Team won the 2nd Place while Fairlene team was the 3rd), conducted for the children of CRYSBRO staff parallel to the annual books donation program. “Our sole intention is to uplift the talents of students who are children of our employees by recognising their talents and creating opportunities to display them. We also want to motivate employees towards environment friendly work approach and that is why we introduced the ‘Haritha Sathkara Green Award’. It is not only recognising the ‘top achievers’ but we expect to push ‘nearly achievers’ towards success through the ‘Most Improved Business Location award’,” Group HR and Administration Manager and Chief Organiser of the annual awards night, Ranjana Mahindasiri said. Established in 1972 with just 100 chicks and a vision to become a market leader in terms of quality, freshness and innovation, CRYSBRO has grown at a steady pace and in the decades since, has emerged as Sri Lanka’s first and most sophisticated, fully vertically integrated poultry producer with operations spanning grand-parent, parent farms, hatcheries, broiler farms and feed mills. This thriving ‘Farm-to-Fork’ concept has been at the core of our success, and which in turn has provided unprecedented support for numerous stakeholders including direct and indirect employees, out growers, domestic maize farmers, and ultimately, the Sri Lankan consumer.